Special Offer special discount is offered to direct client(those who contact directly) from the above rate. Arrive at Paro: Upon arrival at Paro airport, received by representative of Exotic Vacations Bhutan and transfer to the hotel. Khoma – Geynikha (2950 meters): (14 Km, 4hrs), Walk through terraced Paddy fields and coniferous forests to the settlement of Geynikha (2950 meters). 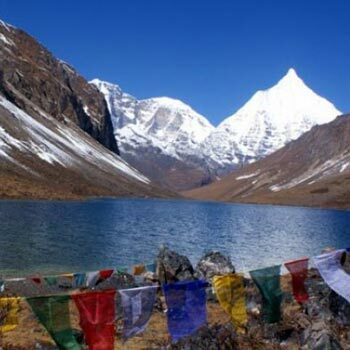 The route then descends to a chorten that marks a camping place along side a stream at 2800 meters. Geynikha – Gur: Crossing a suspension bridge, the trail heads west for a while, then climbs steeply towards the south to a rock platform and a crest at 3200 meters. A further walk of about two hours leads to a camp in a forest clearing at 3290 meters. 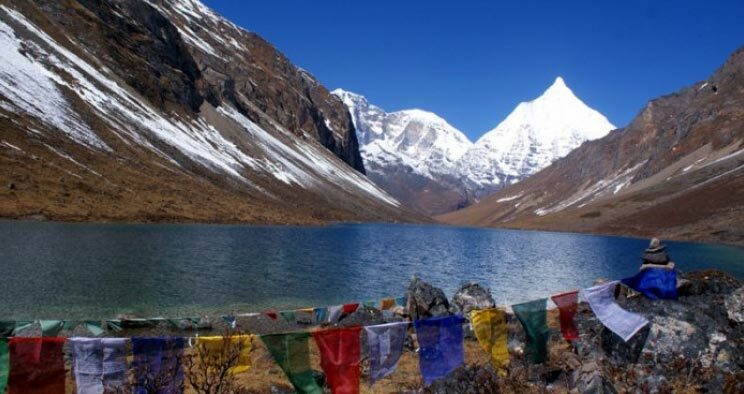 Gur – Labatamba: Cross the pass at 4240 meters for a view of Spectacular Dagala village. Pass though several herders camps enroute to the foot of the broad Labatamba valley at 4300 meters near Utso Lake, where plenty of Golden Trout flourish. There are so many lakes in the vicinity. Camp near the lake at 4300 meters. Dinner and over night in Camp. Labatamba – Panka: The trail climbs along the western side of the lake to saddle at 4500 meters, where there are good mountain views. 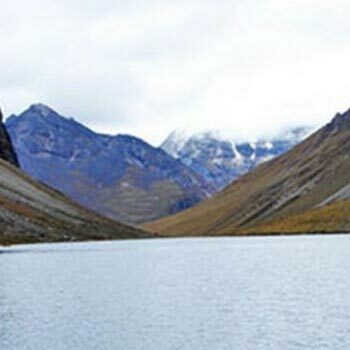 From the pass there is a steep descent to another lake at 4350 meters. A short distance beyond the lake leads to the valley and then to Panka at 4000 meters. Panka – Talakha: The route leads north crossing a pass at 4000 meters, then climbs along the side of the ridge to a crest at 4270 meters. From here there is a view of the Dagala range and a view of Thimphu, far to the North. It is then a long descent through forests to the Goemba and village of Talakha (3080 meters). Talakha – Chamgang – Thimphu: Walk downhill on a steep trail to Chamgang (2640 meters) from where the Vehicle will pick you up and drive to Thimphu. After lunch, Rest and free to stroll in the town. Dinner and over night in Hotel Migmar or similar. Thimphu Sightseeing: The day begins with a visit to the National Memorial Chorten (1974) built in honour of our 3rd King, late His Majesty Jigme Dorji Wangchuk (The Father of Modern Bhutan), Tallest Statue of Buddha, Changangkha Lhakhang, Takin Preserve center, Sangaygang view point, and the Dupthop Lhakhang one of the few surviving nunneries in Bhutan. Thimphu – Punakha – Wangdi: (76 Km, 3 hours drive). After breakfast, Drive to Punakha via Dochula pass. If the weather is clear, we stop for a while at Dochula pass to view Higher Himalayas. While in Punakha, visit Punakha Dzong built in 1637 by Shabdrung Ngawang Namgyal and is situated between Pho Chu (Male river) and Mo Chu (Female river). For many years until the time of the second king, it served as the seat of the Government. The construction of the Dzong was foretold by Guru Rimpoche, who predicted, “…a person named Namgyal will arrive at a hill that looks like an elephant”. There was a smaller building here called Dzong Chu (Small Dzong) that housed a statue of Buddha. It is said that Shabdrung ordered the architect, Zowe Palep, to sleep in front of the statue, while Palep was sleeping, the Shabdrung took him in his dreams to Zangtopelri and showed him the palace of Guru Rimpoche. From his vision, the architect conceived the design for the new Dzong, which in keeping with the tradition, was never committed to paper. The Dzong was named Druk Pungthang Dechen Phodrang (Palace of Great Happiness). The war materials captured during the battle with Tibetans are preserved here. Punakha is still the winter residence of Je-Khenpo and King Jigme Dorji Wangchuk convened the new national Assembly here in 1952. Thimphu-Paro: Departure: Early morning, drive to the airport and farewell. Best Months to do this Trek: March – May, September – 2nd Week of December. Off-season:January,February,June,July,August.